The thoracolumbar fascia [TLF] is a large area of connective tissue - roughly diamond-shaped - which comprises the thoracic and lumbar parts of the deep fascia enclosing the intrinsic back muscles. Most developed in the lumbar region, it consists of multiple layers of crosshatched collagen fibres that cover the back muscles in the lower thoracic and lumbar area before passing through these muscles to attach to the sacrum. The TLF is a complex of several layers that separates the paraspinal muscles from the muscles of the posterior abdominal wall,quadratus lumborum (QL) and psoas major. Numerous descriptions of this structure have presented either a two-layered model or a three-layered model. In the thoracic region, it forms a thin covering for the extensor muscles of the vertebral column. Medially, it is attached to the spines of the thoracic vertebrae, and laterally it is attached to the ribs, near their angles. In the lumbar region, it is also attached to the vertebral spines, but in addition it forms a strong aponeurosis that is connected laterally to the flat muscles of the abdominal wall. Medially, it splits into anterior, middle and posterior layers. The first two layers surround quadratus lumborum and the last two form a sheath for the erector spinae and multifidus muscles. Below, it is attached to the iliolumbar ligament, the iliac crest and the sacroiliac joint. Via its extensive attachment to vertebral spines, the thoracolumbar fascia is attached to the supraspinous and interspinous ligaments and to the capsule of the facet joints. the Posterior Layer consists of two laminae: superficial (the aponeurosis of the LD); and deep lamina. In between these laminae above the L4 level, the aponeurosis of the SPI is present. the MLF is the fascial band that passes between the paraspinal muscles and the Quadratus Lumborum (QL). The anterior layer is defined as passing anterior to the QL and ending by turning posterior to pass between the QL and the psoas. the Anterior Layer has been described as being an extension of the transversalis fascia. Authors using the two-layered model refer to the fascia anterior to the QL simply as transversalis fascia and exclude it from the model. The illustration above shows the superficial muscles of the back. The thoracolumbar fascia is the gray area at bottom centre. The superﬁcial lamina of the posterior layer of the TLF (PLF) is dominated by the aponeuroses of the latissimus dorsi and the serratus posterior inferior. The deeper lamina of the PLF forms an encapsulating retinacular sheath around the paraspinal muscles. The middle layer of the TLF (MLF) appears to derive from an intermuscular septum that developmentally separates the epaxial from the hypaxialmusculature. The unyielding character of the deep fascia enables it to serve as a means of containing and separating groups of muscles into relatively well-defined spaces called ‘compartments’. The deep fascia integrates these compartments and transmits load between them. The connection that the thoracolumbar fascia has with the posterior ligaments of the lumbar spine allows it to assist in supporting the vertebral column when it is flexed by developing fascial tension that helps control the abdominal wall. Vleeming et al have highlighted the importance of the thoracolumbar fascia in integrating the activity of muscles traditionally regarded as belonging to the lower limb, upper limb, spine or pelvis and whose action is thus often considered in that territory alone. They have argued that a common attachment to the thoracolumbar fascia means that the latter has an important role in integrating load transfer between different regions. In particular, these authors have proposed that gluteus maximus and latissimus dorsi (two of the largest muscles of the body) contribute to co-ordinating the contralateral pendulum like motions of the upper and lower limbs that characterize running or swimming. They suggest that the muscles do so because of a shared attachment to the posterior layer of the thoracolumbar fascia. People are starting to investigate the TLF as a potential pain-generating structure in the back], its role inlow back pain (LBP) pathophysiology is poorly understood. In a study using ultrasound, patients with chronic LBP of more than 12 months duration were found to have increased thickness and echogenicity (thought to be a result of the presence of fat) of the the thoracolumbar fascia in the low back ]. Abnormal connective tissue structure may be a predisposing factor for LBP, or a consequence of injury and/or changes in movement patterns occurring as a result of chronic pain. A potentially important consequence of injury may be fibrosis and adhesions, causing loss of independent motion of adjacent connective tissue layers which could further restrict body movements. ↑ Barker PJ, Briggs CA, Bogeski G. Tensile transmission across the lumbar fasciae in unembalmed cadavers: effects of tension to various muscular attachments. Spine. 2004;29:129–138. ↑ Gracovetsky S, Farfan H F, Lamy C. The mechanism of the lumbar spine. Spine 1981; 6: 249-62. 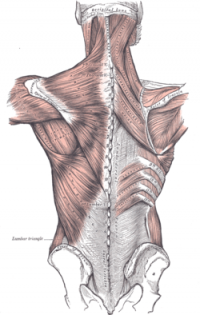 ↑ 5.0 5.1 The posterior layer of the thoracolumbar fascia. Its function in load transfer from spine to legs. Vleeming A, Pool-Goudzwaard AL, Stoeckart R, van Wingerden JP, Snijders CJ. LRSpine (Phila Pa 1976). 1995 Apr 1; 20(7):753-8.